This region includes Arkansas, Kentucky, Louisiana, Mississippi, and Tennessee. The South region welcomes anyone living in or passing through the area to join local groups for regular meetings and special events for sharing the haiku experience and camaraderie. Three groups currently meet monthly in New Orleans and Shreveport, Louisiana, and annually in Hot Springs National Park, Arkansas. 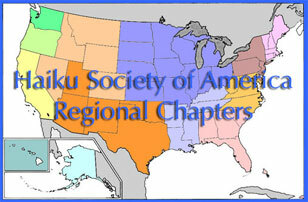 The Arkansas Haiku Society (AHS) hosted the South Region Conference in Hot Springs from its inception in 1997 through 2010. Over the weekend of November 4–6, 2011, the AHS celebrated its 15th annual meeting at the National Park Community College Library in Hot Springs. For details about future meetings, contact Howard Kilby. The New Orleans Haiku Society (NOHS) was founded in 2002 by Johnette Downing and David Lanoue. It meets on the third Monday of each month at the Milton Latter Library, 5120 St. Charles Avenue, near the Tulane University campus. NOHS hosted the 15th annual South Region Conference at the library May 20–22, 2011. NOHS is noteworthy for providing haiku-related activities for poets of all ages as well as varying skill levels. You can find details about meetings, past and future, on their website. The Northwest Louisiana Haiku Society, a subgroup of the Red River Rewriters, held its first meeting on July 2, 2006, at the Broadmoor Library in Shreveport. Founding members included HSA members Theresa Mormino, Nan Dozier, Carlos Colón, and Marian Poe, as well as Pamela Raintree, Marie Brass, and Melissa J. Fowle. The flora and fauna in the South are notable for inspiring haiku moments. Thus the future of haiku and related genres (tanka, haibun, haiga, and senryu, as well as renku) in the region is promising. We hope additional groups will spring up wherever there are a few dedicated poets. Anyone interested in forming a haiku group is encouraged to contact the regional coordinator for information and assistance. Margaret Dornaus holds an M.F.A. in the translation of poetry—focusing on the works of Neruda and Lorca—from the University of Arkansas. She has taught Culinary Arts, teaches English, and is the book review editor for the Tanka Society of America’s journal Ribbons. An award-winning poet and non-fiction writer, her food and travel articles are published in a variety of national publications and her Japanese short-form poems appear regularly in international anthologies and journals. In 2016, she launched Singing Moon Press with the release of her first book of poetry—Prayer for the Dead: Collected Haibun & Tanka Prose. Carlos Wildo Colón, age 63, passed away on Sunday, October 30, 2016. A native of Shreveport, Carlos earned his BA in English at LSUS and later received a Master's in Library Science from LSU-BR. He worked at Memphis Public Library for a short time, then returned to Shreveport to work at Shreve Memorial Library and retired in 2011. He began writing poetry and song parodies in grade school. 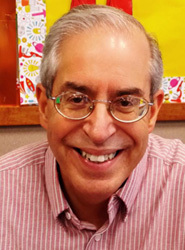 Upon graduation from college, he began submitting to magazines and newspapers and has published over 1,000 poems in a variety of journals including Modern Haiku, Journal of Poetry Therapy, Writer's Digest, Louisiana Literature, Haiku in English, The Southern Poetry Anthology and The Red Moon Anthology. Carlos Colón is the author of 12 chapbooks as well as Haiku Elvis: A Life in 17 Syllables or Less. His poetry is also part of two public art projects: the "Let the Good Times Roll" mural in Festival Plaza and a linked haiku display outside of a temple on Saddo Island in Japan. In addition, Carlos Colón was named Caddo Parish Poet Laureate in 2014. A staunch supporter of the arts, Carlos Colón was a mentor to numerous poets and writers across the world. Locally, he served as a board member of the Shreveport Regional Arts Council (SRAC) where he fostered a deep appreciation for the arts in Shreveport. He was an accomplished bridge player and a man of strong faith. As a life-long member of St. Joseph Catholic Church, he was an active prayer warrior, assisted with the Rite of Christian Initiation of Adults (RCIA) program, and was a sacristan and Eucharistic Minister for daily mass. Carlos is survived by his wife of 38 years, Alma Maria Colón; daughter, Gina Colón Lombard (husband, Christopher); newborn grandson, Anthony James Lombard.